the way the ukulele and stand-up base complimented each other. The whole band was easy to work with and very accommodating to our clients. I would not only recommend them but look forward to working with them in the future. Keaolani - the heavenly dawn - brings Hawaiian music back to its traditional roots. 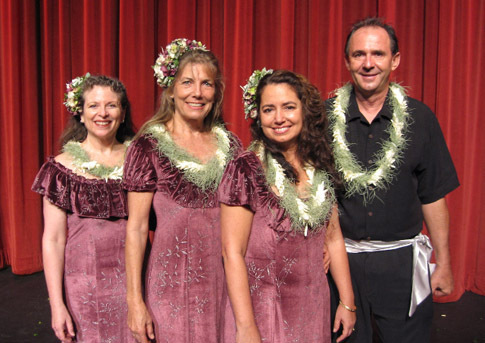 The quartet performs songs with elegant three part harmonies and imaginative ukulele arrangements that will evoke memories of kupuna while sharing stories and historical references of old Hawai'i along the way. Keaolani's unique, signature sound comes from having mentored for several years with one of the most significant figures in 20th Century Hawaiian music, Hawaiian Music Hall of Fame inductee Kahauanu Lake - creator of the classic "K Lake" style - and his successor, Walter Kamuala'i Kawai'ae'a. When your event calls for the Hula, Keaolani features dancers from Halau Wehiwehi O Leilehua (under the direction of Gordean Lee Bailey) as well as dancers from the band. Keaolani has performed with Kahauanu Lake at the Maui Arts and Cultural Center's Castle Theater; they have performed live on KNUI Radio's "Under the Monkeypod" show from Wailuku and have also performed for the legendary Tony Curtis at his birthday party, plus numerous fairs, festivals and private events. Like the dawn, Keaolani will refresh tradition and style - with the elegance of old Hawai'i - at your next event.